100+ days. Capsicum chinense. Open Pollinated. 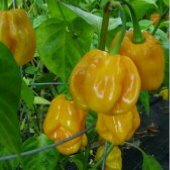 Plant produces good yields of 3" long by 1 ¼" wide wrinkled hot peppers. 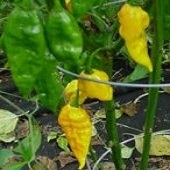 Peppers are very hot and turn from dark green to orange when mature. Plant has green stems, green leaves, and white flowers. Peppers are pungent with a citrus flavor and are very hot! Excellent for salsas and sautéing. Suitable for containers. A variety from Central African Republic. Scoville Heat Units: 325,000. Beautiful plant that produced over 40 peppers on the 1st harvest. Peppers are very good, and i can't even describe how HOT they really are!!! This beautiful yellow pepper produces a wonderful, non-negotiable fruity fragrance, which has spread throughout the apartment. This fragrance is fantastic! Also, the heat has been so severe that it spins my head around! This is just fantastic pepper! Alexander, Russia. I grew these last year. 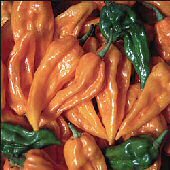 They are of absolutely atomic heat, and the flavor and fragrance is something special too. Good producer.